A national Muslim group wants the anniversary to become a national day of remembrance and action on Islamophobia. 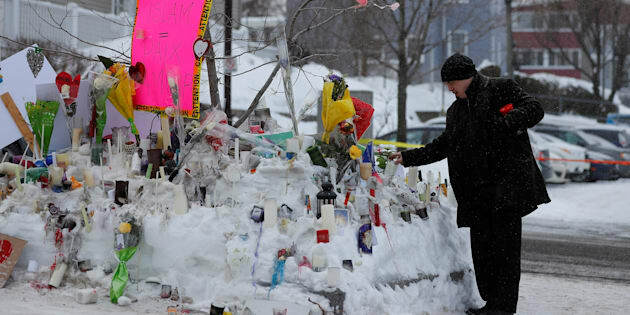 A man puts a candle at the memorial near the site of a fatal shooting at the Quebec Islamic Cultural Centre in Quebec City, Jan. 31, 2017. MONTREAL — The head of an influential Muslim group said he's disappointed Quebec's main opposition parties do not support a call by his organization to make the anniversary of Quebec City's deadly mosque shooting a day of action on Islamophobia. Last Friday, the National Council of Canadian Muslims wrote to Prime Minister Justin Trudeau, asking for the Jan. 29 anniversary of the mass shooting one year ago to become a national day of remembrance and action on Islamophobia. But this week, the province's two main opposition parties made it clear that, while they support a commemoration, they believe Islamophobia is a loaded term. Alexandre Bissonnette, the suspect in a shooting at a Quebec City mosque, arrives at the court house in Quebec City on Feb. 21, 2017. Ihsaan Gardee, director of the Muslim council, attributed the parties' position to identity politics in an election year in Quebec. "In our view, when arguing semantics, it draws attention away from the core issues of hate and Islamophobia and anti-Muslim discrimination that are being discussed and how to effectively address them,'' Gardee said Tuesday. While still waiting for a decision from Heritage Minister Melanie Joly, Gardee said such a designation would help enhance public education about hate, bigotry and Islamophobia and that a day of remembrance is supported by dozens of other Canadian Muslim groups and community partners. He said the term Islamophobia is understood as the irrational fear and hatred of Muslims. "Fear and hatred, if left unchecked, is certainly capable of leading to discrimination and violence, which we saw culminate on Jan. 29 of last year when six innocent Muslim men were killed in their place of worship,'' Gardee said. A PQ spokesman said in a statement the party believes the tragedy should be remembered every year, but notes the term Islamophobia is already a controversial term, while the Coalition says the day should honour the victims of the shooting. "The attack at the Quebec City mosque is a serious tragedy that has struck all of Quebec,'' said Bruno-Pierre Cyr, a spokesman for Leader Jean-Francois Lisee. Parti Quebecois Leader Jean-Francois Lisee speaks at a news conference on Dec. 8, 2017 at the legislature in Quebec City. But the PQ says it doesn't like using the word 'Islamophobia,' which, it says, is the subject of permanent controversy. The party prefers the expression 'anti-Muslim sentiment'. The party notes there is already a world day against racial discrimination and that Quebec's Human Rights Commission could mark it this year by making the Muslim community the focal point. Coalition spokesman Samuel Poulin said the party doesn't intend to support the Muslim council's request. "We believe that January 29th should be dedicated to commemorating the memory of the victims of this terrible tragedy,'' Poulin wrote. "This is the intolerable act of a single person and not that of an entire society.